In 2015, Medina County held its first “Made in Medina County!” event. Under the leadership of Kimberly Marshall, Economic Development Director for the City of Medina and Medina County Economic Development Corporation Executive Director Bethany Dentler, a committee made up of the county’s major cities, chambers of commerce, local Ohio Means Jobs representatives, all high school and Career Center officials, Leadership Medina County and representatives from the manufacturing sector met regularly to develop a mission statement and produce the first day-long program. Made in Medina County’s mission is to raise awareness and educate residents, students and businesses as to the economic importance and career opportunities of our manufacturing industry. The 2015 keynote speaker was Thomas Frey, renowned Futurist, who provided an understanding of the driving forces behind today’s business trends and the world to come. That first celebration of manufacturing was so successful that the planning committee decided to make it an every-other-year event. The plan for 2017 was to make the event bigger and better by involving more companies, more students, and more job seekers. First came the selection of the keynote speaker from one of most successful business ventures in our nation, The Walt Disney Corporation. Working with the Disney Institute gave the committee an opportunity to develop a two-day program. On Thursday, October 19, the Disney Institute provided a day-long program, Disney’s Approach to Business Excellence, sponsored by MTD Products. Participants in this sold-out seminar heard about five powerful lessons in business, lessons carefully developed by the Disney organization in its never-ending pursuit of excellence. These universal pillars of a successful business – leadership, culture, service, brand, and innovation – are the keys to sustained business excellence. Together, these lessons forge an enduring bond between inspired leaders, motivated employees, satisfied customers, and an ability to drive stakeholder value. On Friday, October 20, the Made in Medina County Day began with a morning program that included breakfast sponsored by Westfield Group, and networking for the nearly 1,000 attendees, including 250 students from eight school districts who attended for free. This was followed by the keynote – Disney’s Approach to Leadership Excellence, underwritten by Cuyahoga Community College. After the presentation and lunch sponsored by Oswald Companies, attendees and the general public could check out the free Expo that showcased 88 exhibitors, including area education facilities and all the great local manufacturers making products that are used in our daily lives, but are also shipped all over the world. 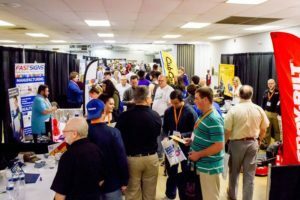 The Expo was intended to provide an understanding of what manufacturing in Medina County looks like today, and also to facilitate job seekers with an opportunity to drop off resumes and apply for jobs. Each company looking for employees had a “Now Hiring” sign at their booth. Responses to this second “Made in Medina County!” event were so positive, the planning committee is already thinking ahead to 2019.